Ditch the takeout and try this asian noodle salad! It's a healthier substitute for chow mein that's loaded with edamame and a spicy ginger dressing. To make the dressing, combine all the ingredients in a blender until very smooth. Refrigerate until ready to serve the salad. It will keep for 4 to 5 days in the fridge. Cook noodles in boiling water for 3 minutes, or as per cooking instructions. Drain and set aside. Cook edamame from frozen in a cast iron pan over medium-high heat in 1/2 teaspoon of sesame oil and 1/2 teaspoon of low-sodium soy sauce (or gluten-free tamari) for 4 to 5 minutes. They should appear toasted and browned, but still with some bright green color to them. Remove the edamame from the pan and keep it on medium heat. Add the cooked noodles and toss in the pan with 1 tablespoon of vegetable oil and 1 tablespoon of low-sodium soy sauce (or tamari), frying for 2 to 3 minutes. You might not need to add more oil depending on if there is some sesame oil residue still in the pan from cooking the edamame. Adding a little bit of oil to the cooked noodles immediately after draining from the water will prevent them from becoming sticky if you're storing leftovers for the week. Mix the finely chopped kale with shredded carrot, cabbage, green onion, and toss in 2 to 3 tablespoons of sweet ginger dressing. Only dress what you're immediately eating. You can store the mixed salad without dressing in the fridge for the week. Divide this mixture amongst your serving dishes. 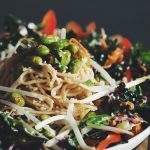 Top the greens with noodles, edamame, julienned red pepper, bean sprouts, and sesame seeds. Drizzle a little more dressing on top, if desired. Serve immediately. I also like adding some roasted kabocha squash if I'm eating this for dinner. I usually slice the squash and coat the slices with a bit of sesame oil, sea salt, and ground pepper. Place them on on a baking sheet and bake in a pre-heated oven at 425°F for 15 to 20 minutes or until golden browned and softened.